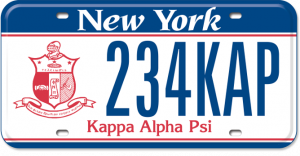 Looking for New York State Kappa Plates? If you are a member of Kappa Alpha Psi Fraternity, Incorporated, financial with Grand Chapter and your Province in the state of New York, and have a vehicle registered in the state of New York, you have all the credentials you will need. Now you can show your pride and support for your fraternity by ordering your New York State Kappa Alpha Psi Custom Plates. You can find the application for New York State Kappa Alpha Psi Plates by clicking on Download Kappa Plates Application. Review the instructions and application. Print, read, complete, and return the application to the address supplied. A portion of the cost of the plate will be applied to a New Rochelle-White Plains Alumni Chapter Scholarship Fund. Passenger vehicles will have 3 numbers followed by the letters KAP. Commercial vehicles will have 4 numbers and 2 letters. The initial cost is $80.00. A combination of up to six spaces (letters, numbers, and blanks) to the right of the Kappa Shield. The initial cost is $111.25. You can find information about purchasing your custom plates from New York State Department of Motor Vehicles' website. Or for additional information, e-mail info@nrwpkappas.com. + Please note that the standard registration fee is $60.00 and the annual renewal fee for a standard plate is $31.25.